Physicists at Emory University have shown how a system of lifeless particles can become "life-like" by collectively switching back and forth between crystalline and fluid states—even when the environment remains stable. "We've discovered perhaps the simplest physical system that can consistently keep changing behavior over time in a fixed environment," says Justin Burton, Emory assistant professor of physics. "In fact, the system is so simple we never expected to see such a complex property emerge from it." Many living systems—from fireflies to neurons—switch behaviors collectively, firing on and then shutting off. The current paper, however, involved a non-living system: Plastic particles, tiny as dust specks, that have no "on" or "off" switches. "The individual particles cannot change between crystalline and fluid states," Burton says. "The switching emerges when there are collections of these particles—in fact, as few as 40. Our findings suggest that the ability for a system to switch behaviors over any time scale is more universal than previously thought." The Burton lab studies the tiny, plastic particles as a model for more complex systems. They can mimic the properties of real phenomena, such as the melting of a solid, and reveal how a system changes when it is driven by forces. The particles are suspended in a vacuum chamber filled with a plasma—ionized argon gas. By altering the gas pressure inside the chamber, the lab members can study how the particles behave as they move between an excited, free-flowing state into a jammed, stable position. 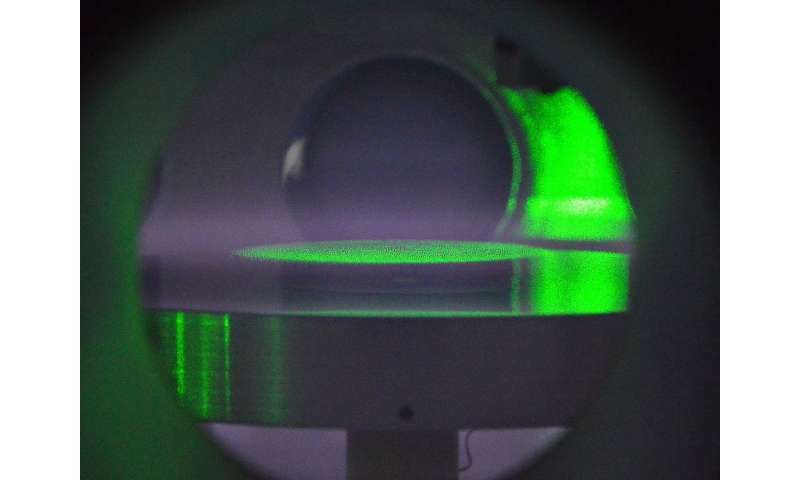 The current discovery occurred after Emory graduate student Guram "Guga" Gogia tapped a shaker and slowly "salted" the particles into the vacuum chamber filled with the plasma, creating a single layer of particles levitating above a charged electrode. "I was just curious how the particles would behave over time if I set the parameters of the chamber at a low gas pressure, enabling them to move freely," Gogia says. "After a few minutes I could see with my naked eye that they were acting strangely." "Imagine if you left a tray of ice out on your counter at room temperature," Gogia says. "You wouldn't be surprised if melted. But if you kept the ice on the counter, you would be shocked if it kept turning back to ice and melting again." Gogia conducted experiments to confirm and quantify the phenomenon. The findings could serve as a simple model for the study of emerging properties in non-equillibrium systems. "Switching is an ubiquitous part of our physical world," Burton says. "Nothing stays in a steady state for long—from the Earth's climate to the neurons in a human brain. Understanding how systems switch is a fundamental question in physics. Our model strips away the complexity of this behavior, providing the minimum ingredients necessary. That provides a base, a starting point, to help understand more complex systems."